I'm off from work all week so I've been enjoying my time at home with my husband and kids. I hate to admit it, but I have taken a few decorations down already. I thought it might be nice to dismantle things a little at a time instead of having one giant mess overtake the house. What happens to me anyway? I spend what seems like days and days decorating yet when Christmas is over I can't wait to pack it up and get it out of here. Although this year, I'm not really in a hurry to get everything down yet this is the year that I have to. On Monday, January 4th, we are having our dining room hardwood floor refinished. If I have to have a big mess from all the sanding and such, I refuse to have a mess on top of the Christmas decorations too. So, I've got to get it all down by this weekend any way you look at it. Have you begun the process of "the big take down" yet? Do you find that you are a cleaning maniac this week? I go nuts cleaning after Christmas every year. I don't know what it is that sends me into crazy cleaning mode, but it happens every year without fail. In case I don't post for the rest of the week, I would like to wish all of you a Happy New Year! Let's hope it's a fabulous year for everyone. 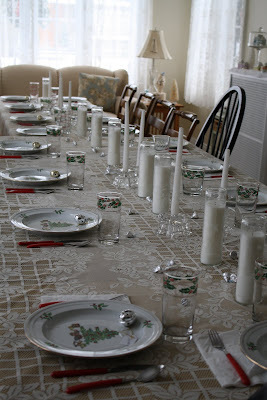 I think all the guests you served were tablescape enough. That is one l o n g table! I just wrote a post about decorating and dismantling. I think you have good reason to start packing your decorations away. I too, like to do a thorough cleaning (and purging) after the holiday -- start the new year right. I'm right there with you Girl! As much as I LOVE Christmas and all of the decorating that goes with it, I'm a take it all down on the 26th kind of girl:) Oh and don't even get me started on the cleaning thing. I go a little crazy too. GOtta start a new year off right, right? SPeaking of the new year...I wish you nothing but the best in 2010!! I can't wait to get it all down and put away. I need my house back again!! LOL!! We are having our living room and dining room hardwoods refinished as well. It's a new dustless system so I am pretty excited. Happy New Year!